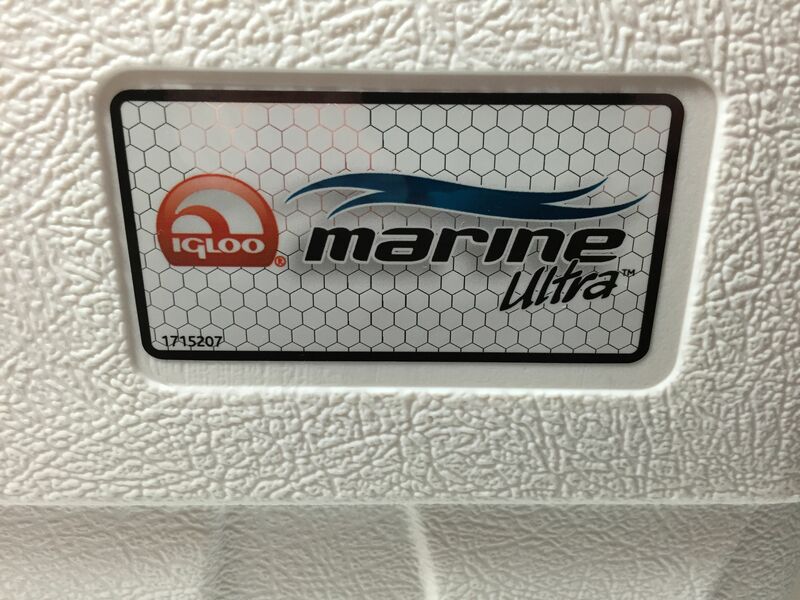 15 Quart Marine Cooler by Igloo. 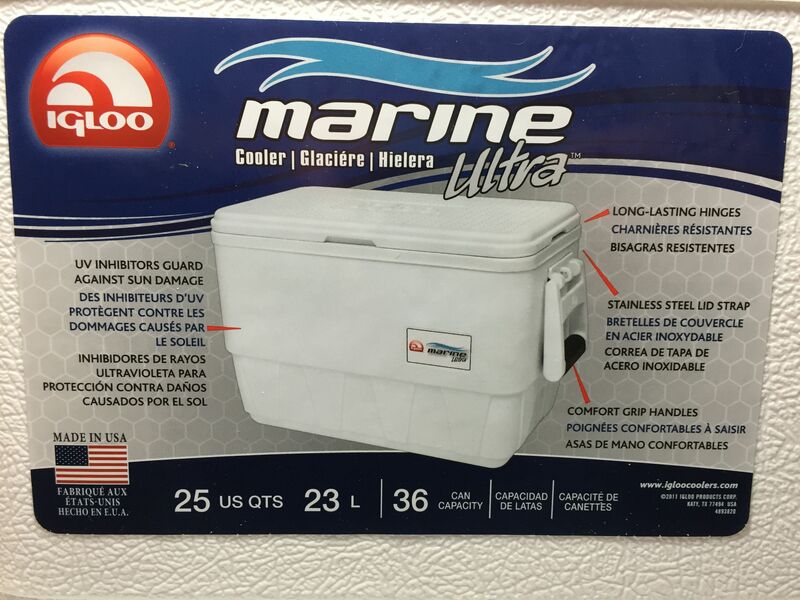 Features – Ultratherm insulated body, Stain and odor resistant liner, UV Inhibitors to protect against sun damage, Reinforced comfort grip handles, Dimensions 20in L x 12in W x 14in H.
I picked up Igloo’s 25 Quart Marine Cooler after I saw someone with one at an event and I really like the size and the looks of it. I got this primarily for carrying and keeping beer and other items cold. 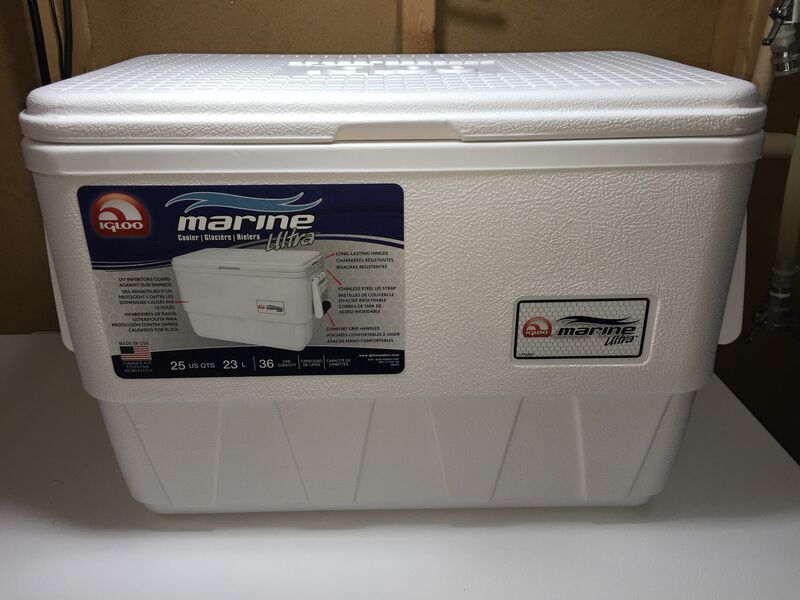 I’m not suggesting this as a good cooler to use as a mash tun (no drain). 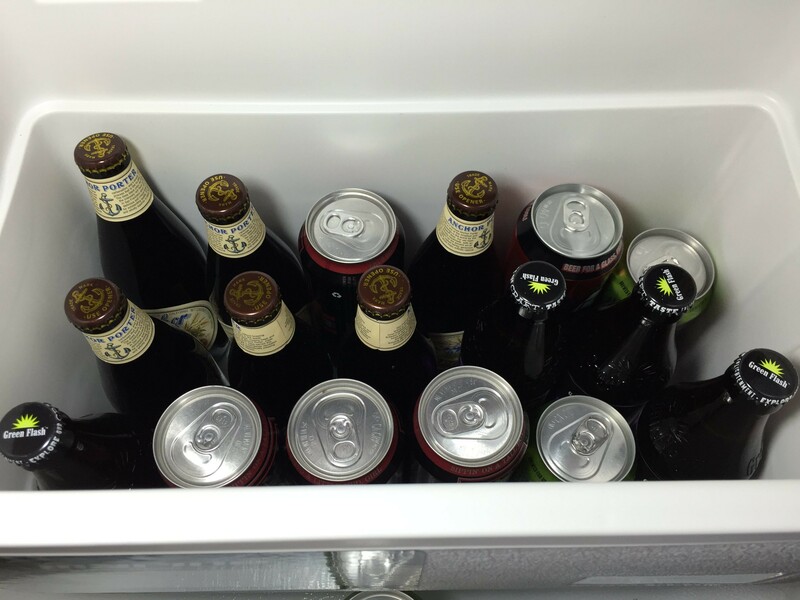 I’m suggesting it’s a good cooler to use as a… cooler. The left hand side label – click to zoom. UV Inhibitors Guard Against Sun Damage. Long Lasting Hinges. Stainless Steel Lid Strap. Comfort Handles. Made in the USA. 25 Quarts/23 Liters. 36 Can Capacity. 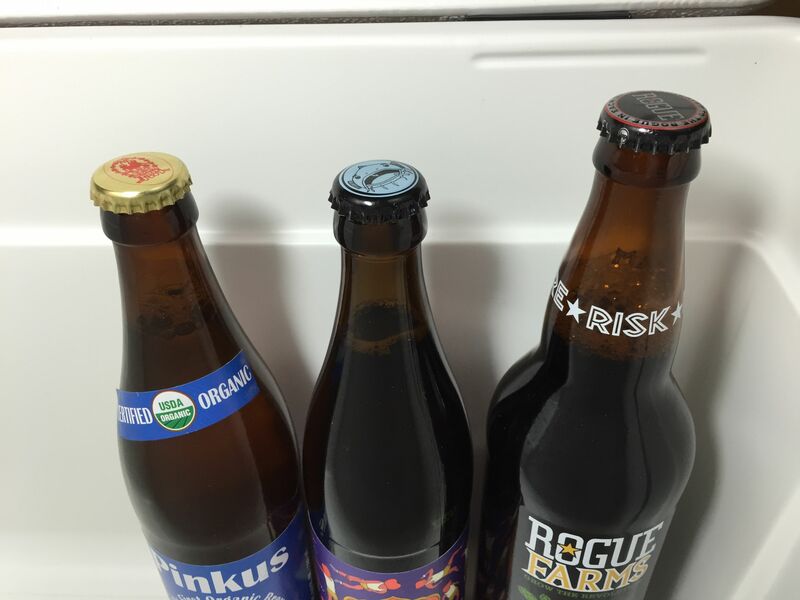 This holds both larger/taller German Style bottles and 22 oz bottles. 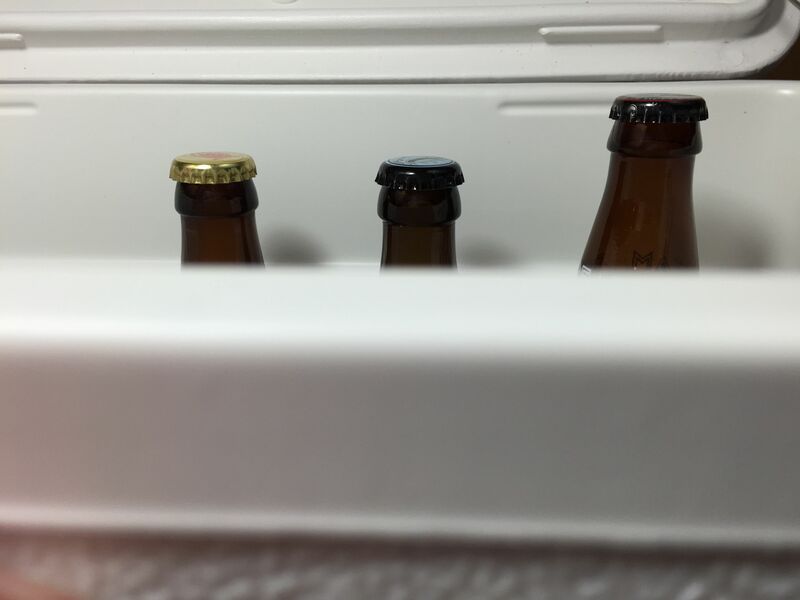 The 22 oz bottles come very close to poking up over the top of the cooler, however, the lid has an indentation and closes fine with 22 oz bottles. You can stack two 12 ounce cans, you can also stack a 16 oz can and a 12 oz can. 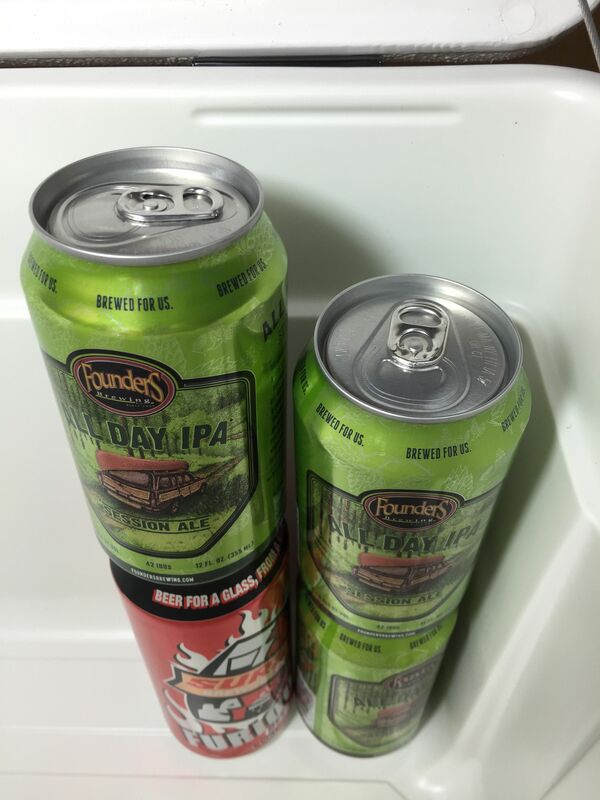 Two 16 oz cans are too tall. 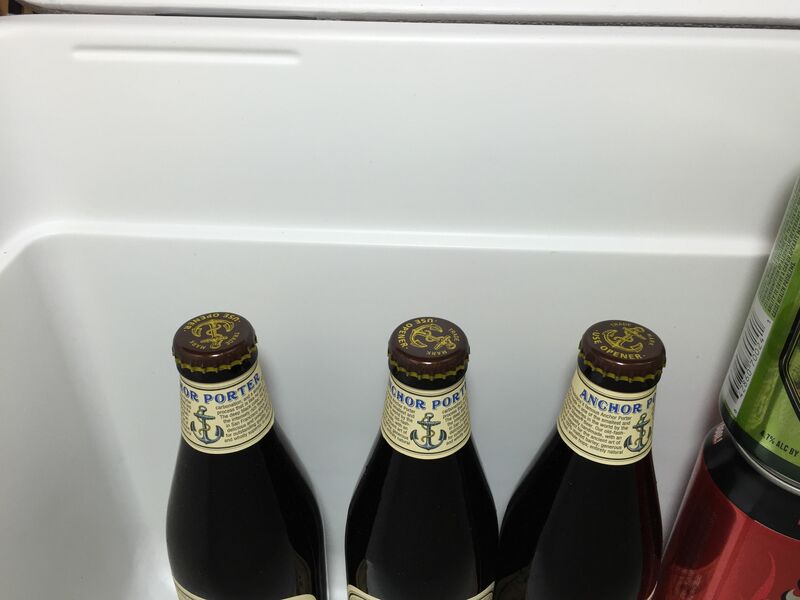 Of course standard and standard-ish (like these Anchor Porter) beer bottles work just fine. 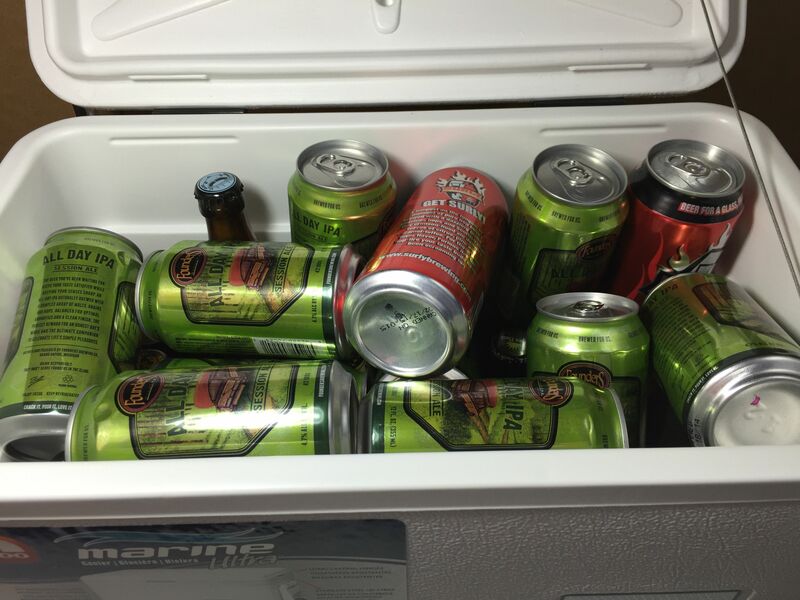 Without a lot of thought while packing… this cooler held all of this beer. I’ve owned this since early 2015. I really like it’s build quality and size. It’s well made. 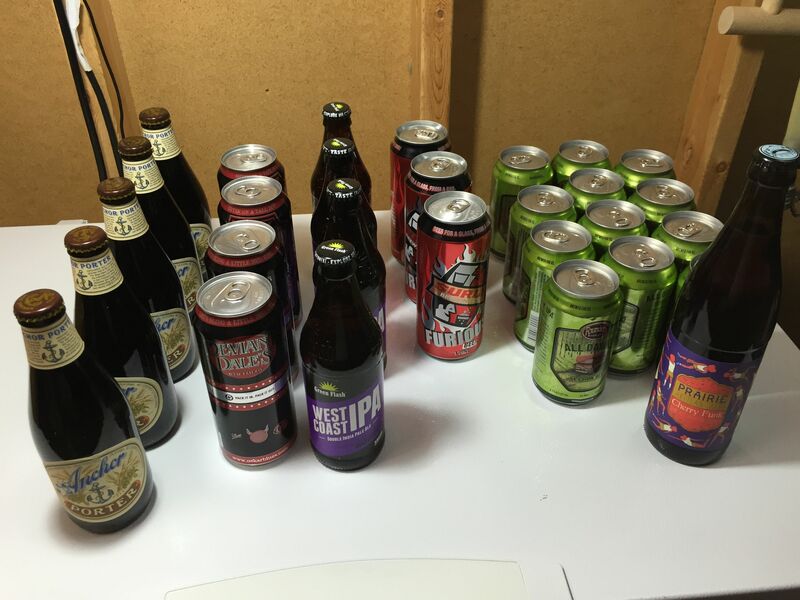 It’s compact, but can still hold quite a bit including the ability to carry larger 22 oz bottles. 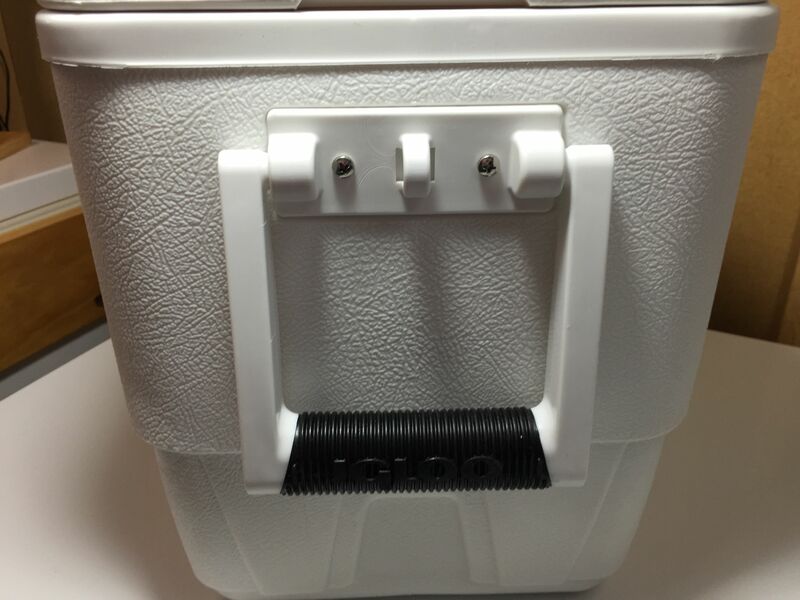 This entry was posted in Amazon, Cooler-As-a-Cooler, Coolers, Featured Reviews, HBF Tested, Portable Serving, Reviews, Reviews & Top Posts on April 22, 2015 by admin. 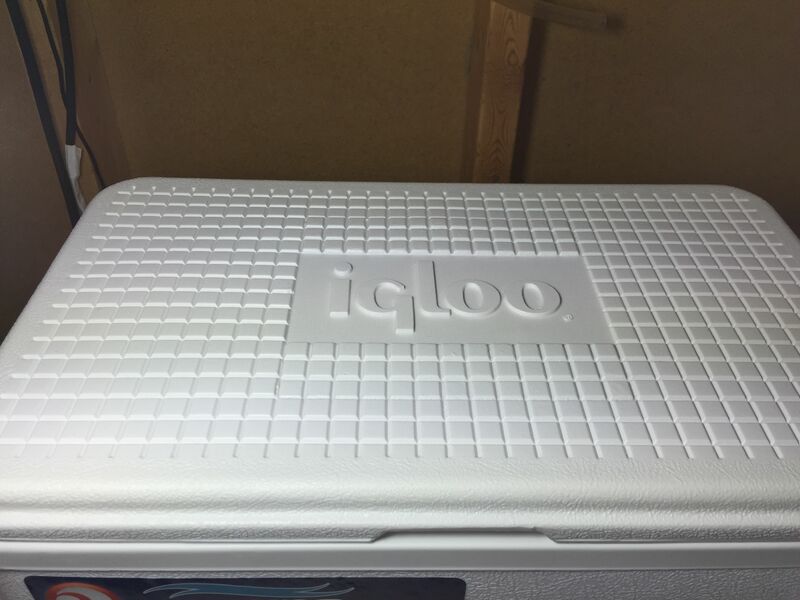 Nice cooler, but Amazon currently says 3-6 weeks for delivery.